Hattie Carnegie presents suits incomparable in every detail. Jacket lines have a pleasing variety. Some are snug, button-down-the-front affairs; some nip in at the waist and flare slightly below it – some are cutaways with elbow-length sleeves, and some are cut wide in the bodice to serve as show windows for enchanting little blouses. 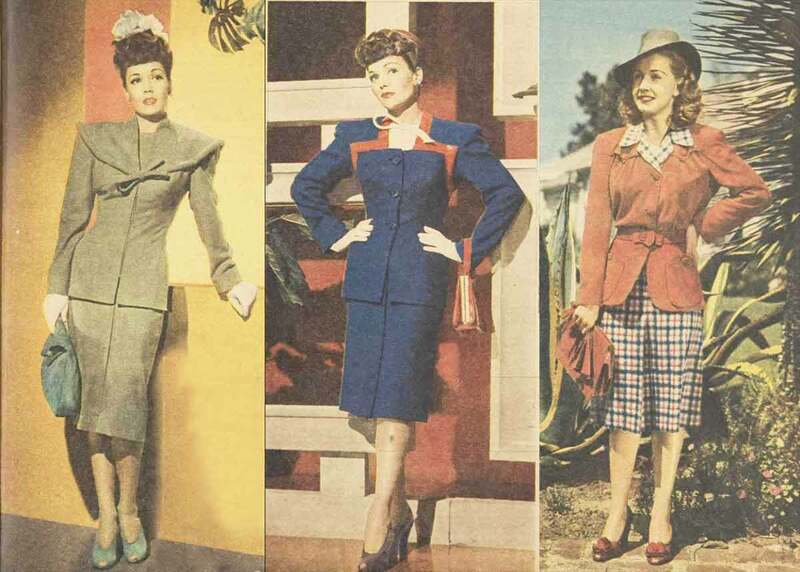 To the left, an important dressy 1940s suit, sveltely tailored, yet very feminine. Jane Wyman likes it done in soft green wool, and adds dash with a fetching cap of two huge white roses. Next, fashion conscious Jane highlights a slim suit of light navy-blue wool with gleaming bands of red patent leather. With it a red patent leather bag, and a saucy pillbox hat to match. To the right, the lovely Bonita Granville wears a simple shirt-maker frock of red, white, and blue checked wool is topped by a casual red suede jacket, helping youthful Bonita to look both smart and patriotic.